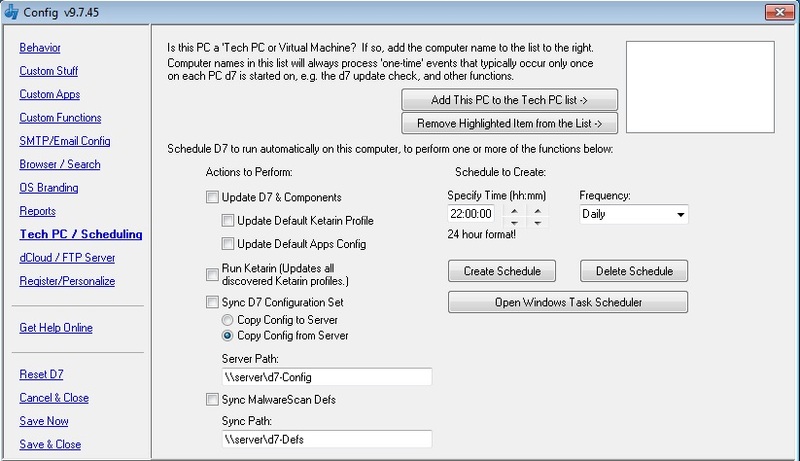 If you are running d7 on a technician PC or virtual machine, adding the computer name for this PC to the list will allow d7 to alter it’s behavior slightly so that you may properly test d7 on that particular machine, or use it without certain features that should only occur on a client’s PC. Update d7 – Checks for and updates your copy of d7 if an update is available. Run Ketarin – Updates the d7_DefaultApps profile, then runs Ketarin automatically to update everything in the profile; also runs Ketarin automatically to update any custom profiles you may have created. Copy Config to Server – Copies your configuration to the server, overwriting existing files. Copy Config from Server – Copies the configuration on the server to your local D7 directory, overwriting your existing configuration. NOTE: When you create a schedule on this page, it does create a Windows Scheduled Task with the parameters specified, HOWEVER the configuration for the schedule itself is NOT saved in d7’s configuration, so these options will reset to default values the next time you visit this page! Don’t freak out! Your schedule (if set) is still set as it should be — you may verify this in Windows Task Scheduler!